Given the fact that one of the primary purposes of a warehouses is to store or manufacturer products, equipment, or other valuable assets, it follows that security and fire protection will be a top priority for anyone with responsibility for a site of this kind. Threats such as break-ins by professional criminals, opportunistic theft by the general public or members of staff, fire damage and other warehouse health and safety regulation issues, and vandalism must all be addressed as effectively as possible. Additionally, security technology such CCTV can also be used in an operational capacity to aid management and improve efficiency. Designing and implementing a robust warehouse solutions and fire safety strategy which takes full advantage of all that the latest technology has to offer is a complex process which requires in depth analysis of the specific issues associated with the site in question. Implementing the most appropriate strategy for your own warehouse solutions will inevitably utilize a range of solutions, each with its own set of capabilities and features. The solutions at your disposal include security cameras or CCTV, security lighting, integrated security systems and fire safety systems, site access systems incorporating gates and barriers, and intruder and fire alarms. 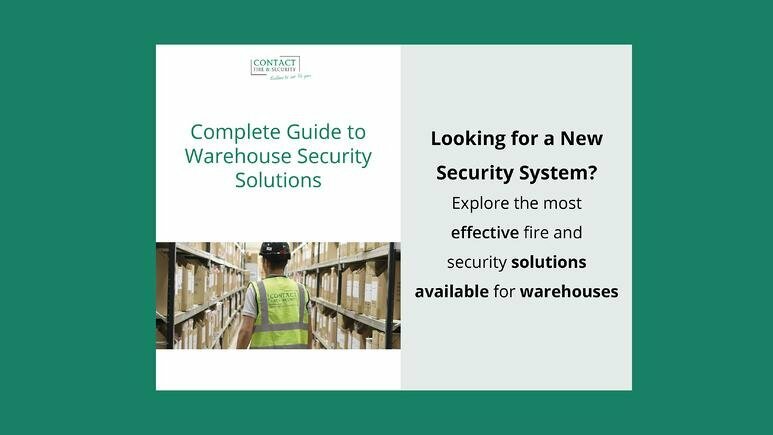 In this guide, we outline all the security and fire safety options mentioned above, and explain how they might be best employed to provide optimum fire safety and security for your warehouse. To further expand on this, we also offer any interested party a detailed warehouse fire & security consultation ABSOLUTELY FREE. This will outline the most effective and efficient package to deliver a flexible and cost-effective fire and/or security solution which has been tailored to meet the unique challenges posed by your warehouse. Prospective and existing clients often come to us for advice regarding many different aspects of fire safety and security. While we are always more than happy to help, and welcome any enquiry via phone, email or social media, to save time we've prepared answers to the key questions we most commonly receive. If you do not find the information you're looking for, please don't hesitate to get in touch, either in the comments or via any of the methods mentioned above.